"Not fair to implicate PM Najib ..."
Not to the blogger Another Brick in the Wall, who hints that he will not stop until the bank responds. The people at Maybank may or may not be perturbed, but there is a quiet discomfort in the higher ups. "What happens at Maybank is the responsibility of the bank's top management. 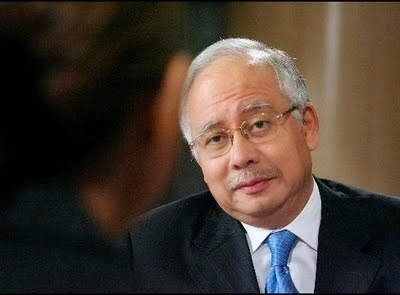 We at the Yayasan are not involved in day-to-day," a source insists last Saturday at the launch of UiTM's RM1billion education fund by the Prime Minister, questioning the blogger's motive for "dragging the PM into the picture". "The Maybank building was designed by the architect Hijas Kasturi to emulate the kris, a weapon and more a symbol of power in Malay culture. It was symbolic for Maybank as the leading Bank of Malaysia and owned by Permodalan Nasional Berhad (PNB). In a complex organsation structure, PNB is owned by Yayasan Bumiputera Berhad in which the Chairman is the President of UMNO and members of the Board of Trustees are UMNO leaders too. Amanah Saham Nasional Berhad (ASN) is a subsidiary of PNB which managed the Sekim ASN and ASB initiated by PNB. This was all established under the NEP era to increase Malay and Bumiputera equity ..."
The blogger did not implicate Dato Najib. Day to day running is not Najib's purview. You listen to this goon, and soon every one starts posting on how the Melayu got massacred in every industry. By re-posting this, you Latuk Locky are saying that there is no meritocracy and Malays are getting fired left, right and centre. There is a DAP conspiracy to destabilise Maybank. I suggest you take a one-way flight to Mars, and stay there with a lifetime's supply of whiskey. I am willing to contribute to this supply. Recently my son and his friends four of them went for an interview with Astro at Bangsar South for the position as a customer servise exec. Three of them fail the interview which the final interviewer is chinese.One of them succed which the final interviewer in melayu.My son sangat kesal dan kecewa.He thought if his interviewer is melayu he might have the CHANCE and the OPPORTUNITY.Tahniah pada kedua dua melayu tersebut.Fyi all of them is a degree holder from UiTM. You are so mischievous in re-posting this racist article. Shame on you, rocky. I thought you were always level headed, non-racist, but I now know better. Another tale to deflect attention from the ills plaguing this country and your boss. Before your readers go ballistic and start blaming "others" for that sorry state of affairs at Maybank, perhaps we should be reminded that the situation at Maybank is not an anomaly but increasingly the norm. Just may be the increasing popularity of sekolah agama and our national schools not emphasizing English may be contributing factors. The only language that counts is the language of your customers. And bank customers in Malaysia, at least the important ones, meaning, those with money, are English speaking. Perhaps when our boys and girls start taking math, science and English seriously, then may be we can begin reversing the Maybank trend. It is truly shocking to read this news. The only reason I still support UMNO is that they still support lazy, has-been "journalists" with zero writing skills, using taxpayer money. If ageing, untalented Melayu hacks with retro 1970s hairstyles can still do well, we cannot fault the government for not helping Malays. They are doing all they can. Credit where it's due, please. PS: I am personally voting for UMNO in GE14, in order that they can send ABITW for the grammar lessons he so obviously needs. What was told to happened in BI and CIMB are now happening in Maybank. The language used is full of venom. He should write more objectively to merit some credibility. I wouldn't lose any sleep over it. Damaging a bank's reputation based on hearsay without proof is inviting a lawsuit. Abitw should be sued if he is blogging based on hearsay or on unfounded accusations. A Bank can lose millions when it's reputation is tarnished. "Abitw should be sued if he is blogging based on hearsay or on unfounded accusations." Added Bribes In The Wallet (ABITW for short) needs another nice, fat lawsuit shoved up his fat crack. Very true.There is a DAPigs conspiracy to destabilise Putrajaya inorder to take over or becoming the puppet master. Get rid of the Maybank chairman useless fellow. he is also sitting in on education ministry set up. Stupid fool who is doing the damage now. You wait and see for the results. Thruth of the matter is that the people from the planet Kiasu are more mischievous and cunning dan berlagak as if this racist kind of thing is not in their blood.LOL pleeeease. Even though I respect your right to express your opinion, I despise your utterly unnecessary name-calling: loony. Latuk Locky and worse of all, insulting the blogger's religious belief. This shows us what kind of a person you are. Being spiteful and showing contempt for others is being demeaning and debasing to yourself. All Malay account holders ( individuals and businesses and agencies ) with Maybank should consider closing their accounts and transfer them to other banks until the bloodsucking matsalleh and the Gestapo gang are purged from Maybank. Pegi belajar bahasa England lah....goon refers to ABITW not Latuk Locky. And what has religion got to do with it ?